What is Silk Fiber in Textile? Like wool fiber, silk fiber is an animal fiber. But instead of being grown in the form of hair, it is produced by insects as a handy material with which to build their webs, cacoons and climbing ropes. Almost the entire commercial silk industry is based on one insect-the silkworm. In spite of its name, this is really a caterpillar; the silk is made by it when it wants to change into a chrysalis and then a moth. It spins the silk and wraps the fiber round itself in the form of a cacoon inside which it can settle down in comfort. For three thousand years, China held a monopoly in the silk industry. Then sericulture – as silk production is called-spread to Japan via Korea. Gradually, silk production spread westwards over Asia. Many tales are told of the ways in which the eggs of the silkworm and the seeds of the mulberry tree on which it fed were smuggled from one country to another. According to legend, they were carried to India by a princess who concealed them in her head-dress. Cultivated silk is better than wild silk. 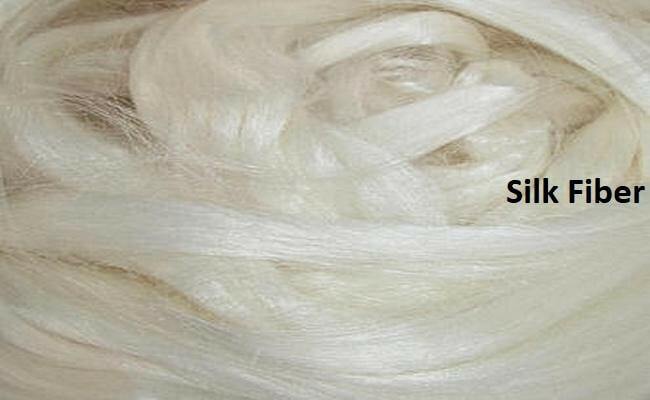 Silk fiber length varies from 400 to 700 meters. Silk is a very fine fiber. Its fineness varies from 11 to 12 microns. Strength of silk fiber is reasonably good. Its tenacity varies from 2.4 to 5.1 gram per denier. Extensibility is 15% when at break. Recovery from stretch is 90% when extension is up to 2%. Resiliency of silk fiber is moderate. Its abrasion resistance is reasonably good. Moisture regain of silk fiber is 11%. Normally, silk fiber is unaffected by fungus, moths and insects. Its burn slowly when contact with flame. Silk fiber also self-extinguishes. Heat and current flow rate is low. Damages by the effects of strong bleaching agents. Hence, perfectly while silk fabric is not seen. Strong mineral acid damages silk fiber and strong alkali also damages silk. Silk is unaffected by the organic solvent hence dry cleaning is safe. Dyeing at low temperature by direct, acid, basic, vat and reactive dyes could be done. There are so many uses of silk fiber in textile and apparel manufacturing industry. Silk fiber is widely used all over the world. It is used for children’s wear, ladies wears, tie, suits etc. purposes. What Types of Dye Used in Textile Wet Processing?